What better way to celebrate the U.S. 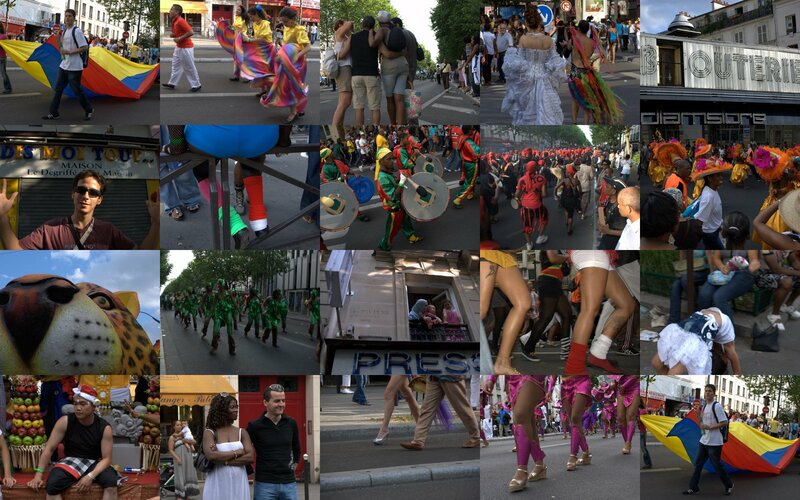 Independence Day than at the Carnaval tropical de Paris? The vibrant celebration started in the east of Paris at Place de la Nation and made its way North through Paris’ working class neighborhoods, towards the bassin de la Villette, finally ending at the Porte de Pantin in the 19ème. Jorge and I searched endlessly for the perfect vantage point and finally found it along the Boulevard de la Villette in front of a bus stop. We readied our cameras and waiting impatiently with the restless crowds for the parade to arrive. Then we heard the drumbeats and then saw the colors and dancing figures as the fanfare approached. It came in flashy, energetic fits and spurts, the flamboyantly dressed participants jumping and dancing alongside lavish floats. The lively rhythms and beats of the marching bands kept the crowd smiling and cheering. The steamy hot summer day made it feel even more like the tropics! Colorful flags and banners heralded the groups of Caribbeans, South Americans, North & West Africans as well as Indonesians – a rich and colorful cultural mix of Parisians converging and celebrating their different cultural heritages. It reminded me of Mardi Gras in New Orleans. It was a wonderful way to celebrate the 4th of July! This entry was posted on 5 July 2009 by ladymissmba. It was filed under Uncategorized .